Return on investment (ROI) isn’t just a phrase at LCI. Most businesses think of public relations, marketing communications and social media as an expense line item. 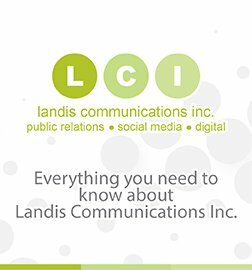 But at LCI, we believe that the dollars you spend on public relations and all marketing communications activities should be a positive investment in the growth of your business. At the outset of our working relationship, we sit down with each client and ask them to tangibly define business success. That doesn’t just mean, “I want to be in the Wall Street Journal.” We want to know what moves the needle to help your business grow. That might mean more website visits; creating the right messages for your business; helping recruit talented employees; increased exposure in the trade or B2B media; leveraging more message pull through; delivering the right influencers for your business; quantifying increased engagement on social media; increased back links to your website; more positive brand awareness; or even sales. At LCI, we’re not afraid of numbers – we embrace them. How do we do this? By partnering with our clients, we identify which communications activities – and which identified audiences – will most efficiently help your business in the most strategic manner. In the end, with every marketing communications program, your business should expect solid results. LCI tailors an individual communications program tied to those goals, with tangible ROI metrics – developed just for you. It’s our PRomised Results© program – one more way that LCI delivers. We have multiple examples of our PRomised Results© program that we’re happy to share with you. We’d also be happy to discuss creative ideas of how we can help your business grow through innovative marketing communications initiatives. For more information about LCI’s PRomised Results©, contact Brianne Miller or David Landis at: [email protected]; [email protected] or call us at: 415.561.0888. LCI looks forward to working with you – and delivering the right results to help your business succeed.